Sometime last summer, I joined maulepilots.org after buying an M8-235 in El Salvador. I was not new to Maules, having flown several, but it was the first one in my hangar that had my name on it. I had made several attempts at buying one, but for one reason or another ($$$), it hadn�t happened. 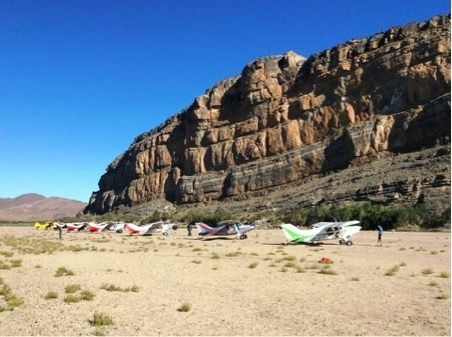 Soon after I joined maulepilots, I began to chat with Chris Erasmus from South Africa, which culminated in an invitation to go to South Africa and fly his Maule. And he stressed, �you will be doing all the flying!� How could I say no to that, and after a quick glance at my bank statement, I immediately purchaed the airline ticket before I spent the money. 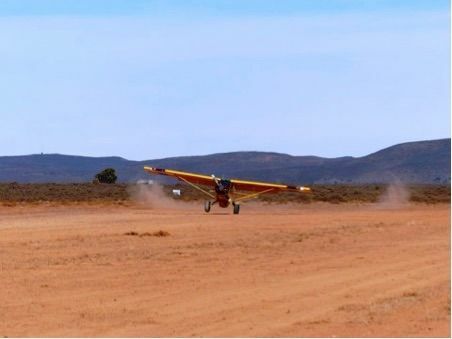 In September 2014, Chris and Gareth Pollock flew teir Maules to the Richtersveld area on an exploratory trip. 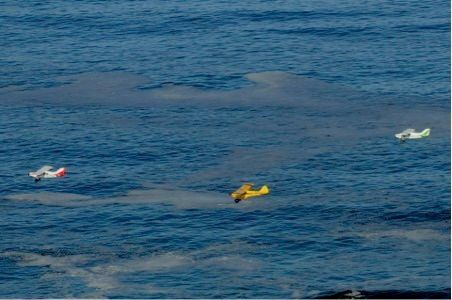 Their object was to explore the place and find suitable landing spots with the intention of having a more comprehensive trip at a later date. 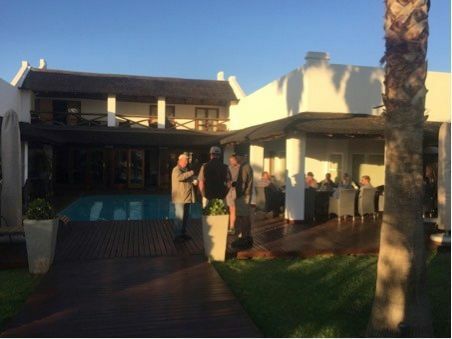 All the planning came together this May 2015, after invitations were sent out by Chris to all the Maule drivers in South Africa earlier this year. The interest was huge. Six Maule drivers signed on for the trip. Amongst them, me, Eduardo Poma from El Salvador. A little country in Central America, not many people knew existed. I travelled all the way to South Africa specifically to join them on this awesome trip. (One nice thing about all that airline flying was that I flew in an Airbus A380 for the first time � great stuff!!) 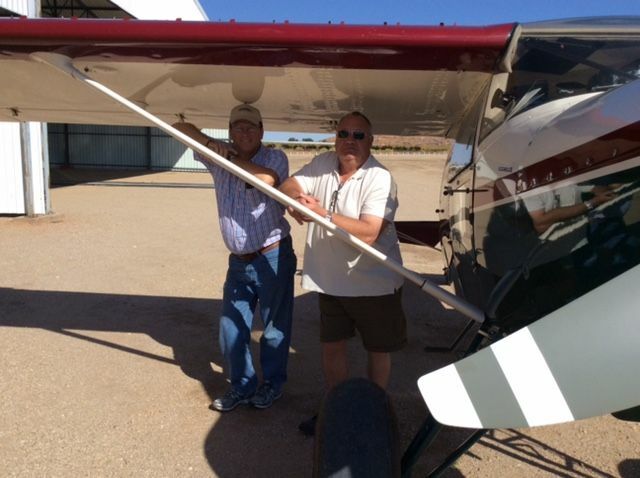 Brett Warren and his father Stan joined us from Botswana in their Husky, flying in to Tedderfield south of Johannesburg on the Sunday before the trip. We were the only foreigners. The first thing I had to do before starting this adventures was to get checked out in Chris� Maule, an absolutely gorgeous M7-235 (250hp really), for insurance and South African regulatory purposes. Let me tell you, this is the most beautiful Maule I have ever seen, with a great paint job, 4� extended gear, 31� ABWs, scimitar three bladed prop, and great avionics. Did I mention that it also has high compression pistons, delivering 250hp? Well, I thought I�d say it again! The check ride consisted in a couple of revolutions around the pattern with high time Maule instructor Tommy van der Woude. I guess that was all he needed to believe(have faith) that it looked like I wasn�t going to crash and burn on the first takeoff attempt. I wish I had that much faith in me! Well, on Monday morning, 25 May 2015, bright and early, we set off on our expedition. Our plan was for everyone to join up at Almar Exclusive Game farm near Bloemhof, since planes were coming from all over South Africa. Nico Brandt and Darrel Lush flew their M6 235B from Tedderfield, followed by Brett Warren and his dad in their very yellow and dark red Husky. 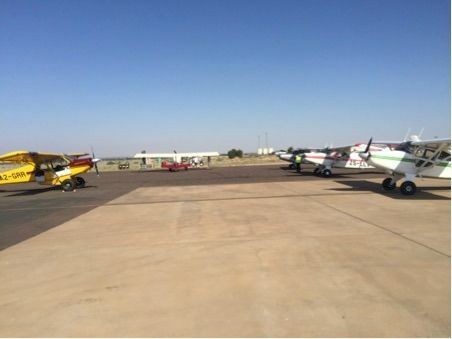 Chris and I departed from Rand Airport along with Warwick Steinhobel and Cyle Nienaber in Warwick�s M5 210C. 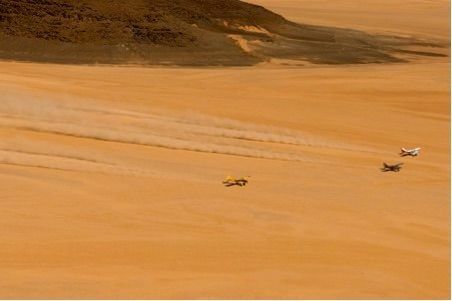 Warwick had just refitted his Maule with an array of fancy new instruments and an engine monitor, an investment that paid for itself on this trip alone: their fuel consumption went down to around 9 gallons per hour compared to 12 to 13 gallons per hour, which is the norm without an engine analyzer. 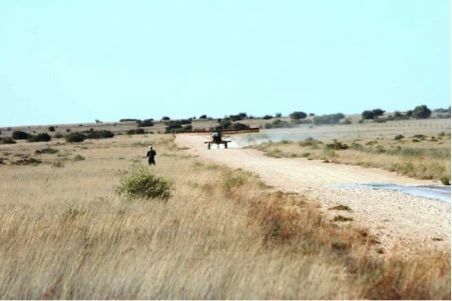 Gareth and Peter Pollock flew their M7 235B from Harrismith along with Willem Nieuwenhuis and his son, Ruan, from Margate, also in a M7 235. They met up on the Sunday before in Harrismith, in order to join us. Around 9 that Monday morning we all arrived at Almar Exclusive Game farm, which sports a dirt runway in very good condition. It was a breeze landing there and not yet a true test for the abilities of the aircraft, or the skill of the pilots. 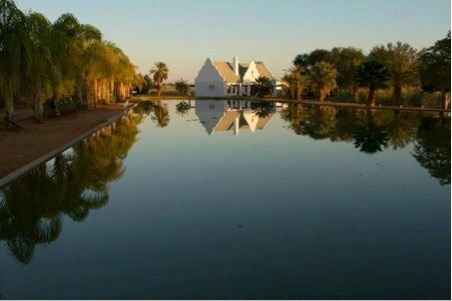 Almar Exclusive Game Farm is a beautiful resort about 25 miles West of Bloemhof. We had a very comprehensive breakfast of eggs, bacon, yoghurt, cerials, cold meats, boerewors and coffee. If you haven�t been to South Africa, you have no idea how much meat these people eat. They even eat meat for a snack! Their accommodation was just as good as the breakfast, with a fully functioning hunting venue and 14 species of game to offer. But that is not what we were there for. We were only there for a couple of hours, stopping only to break the tedium of the long flight from Johannesburg to Upington. Highly recommended as a mid-way stop for flyers. The runway parking area at Almar Exclusive Game Farm. Chris' Big Foot in front. We left Almar very reluctantly as another 2 more hours of flying loomed ahead as we headed for Upington over some featureless terrain. But, it had to be done. Deon from Aero Weather predicted a strong headwind and it was one of those occasions I wished that he had been wrong, but his prediction was spot on. We tried high; we tried low; we tried at tree-top level, but we ended up flying into a 20kts headwind. What should have been a two hour flight turned into 2.5 hours as we trundled along showing a ground speed of 100kts, and in places dropping to 90kts, when it should have been around 120kts. Upington was a welcome relief for tired pilots. In spite of causing havoc for the poor trainee air traffic controller when 6 planes arrived simultaneously, while an Airlink jet was trying to take off. There was some maneuvering and adjusting and some of us had to hold off for a while, but eventually everybody got on the ground safely, and Airlink got airborne without a delay. The young controller handled the situation very well. Mark Oostingh and his wife Lauren joined us in Upington from East London in his MX7 180B. As always, refuelling at Upington was a pleasure at $4.28 per gallon (compared to $5.60 a gallon in Johannesburg), plus the boring drudgery of the long flight was over and the fun was starting. 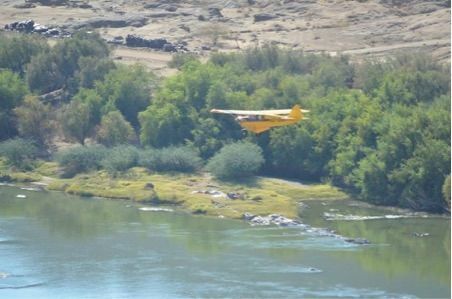 First up was a short 30 minute flight from Upington to Dundi Lodge, and ATC graciously cleared us low level along the river to Dundi Lodge. The runway at Dundi Lodge was long (and very narrow) and in good condition with concrete run-up strips to save the props. Dundi Lodge recommended that aircraft land uphill and take off downhill, but in the Maules which need less than 200 meters to land and take off, it wasn�t a concern for us and even less so for the Husky. Dundi Lodge is a 5 star resort with all the bells and whistles normally associated with such a star rating. Berto van Zyl, the owner was waiting on the runway for us and he had enough hangar space to park all the planes under cover. The group was now complete and Dundi was also our last fuel stop until we got to Vredendal. 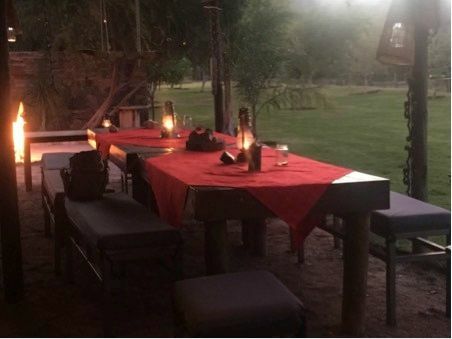 The restaurant at Dundi Lodge served a fantastic meal, on par with anything you can get at the best restaurants in Johannesburg. On request they will take you to some of the better fly fishing spots on the river. As a fly fisherman myself, I strongly recommend the venue. The next morning Berto arranged a tour to the Augrabies falls, and in spite of the river being low it was still a magnificent sight. A must, if you ever visit. 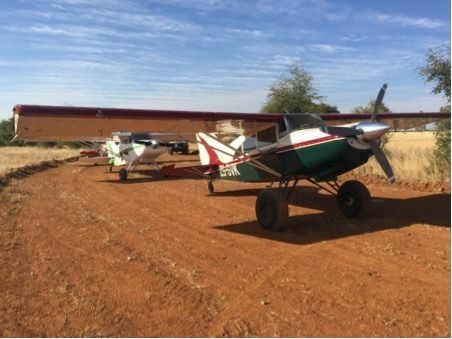 After the falls visit and a wonderful buffet breakfast (more meat), the intrepid flyers fueled up from a 5,000 fuel tank at Dundi Lodge, and we were ready to proceed downriver to Umkulu Lodge. The take-off from Dundi was uneventful and all the pilots stayed in communication with regular updates on their positions as we followed the river. Most flew low over the river to enjoy the scenery. 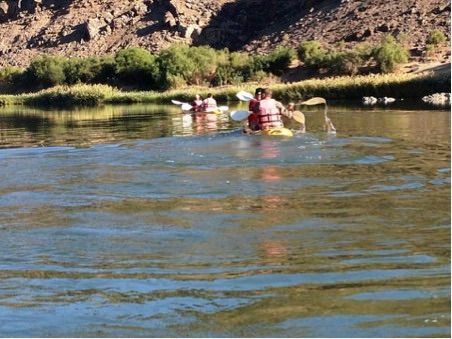 This, the Orange River, is the border between Saouth Africa and Namibia, so we had to careful and stay on the south side of the rivar at all times. It is a truly spectacular sight to follow the river and observe, as you leave civilization, how the scenery changes: a verdant green strip of river and vegetation cuts through the desert that surrounds it on all sides. Heaven alone knows what the animals feed on, as there is hardly a blade of grass in sight. Our next stop was Umkulu Lodge, better known as the Growcery. 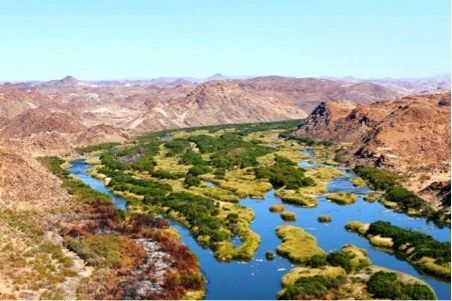 It is a little oasis in the middle of nowhere, smack in the Richtersveld (mountainous desert landscape). 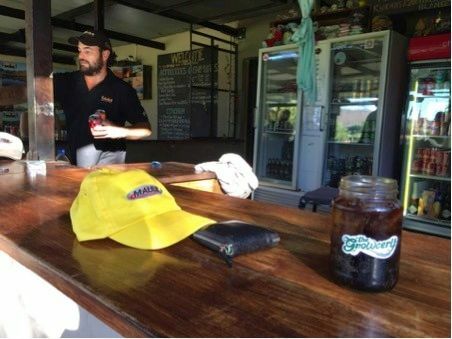 Hennie Prinsloo developed this little piece of paradise to serve as a base from which to conduct his river tours. It also happens to have some of the finest fly fishing for big and small mouth yellows in the country. The only problem is that there is no runway! On their previous expedition Chris and Gareth identified a couple of possible landing spots around Umkulu lodge and it was time now to put them to the test. It was decided that a sand bank on the river that we had previously identified was the most viable landing spot. It offered the best escape routes in both directions for a missed approach or an aborted landing if things were to go wrong. The Umkulu staff was on hand to greet us with some cold beverages, accompanied by a lot of banter from the pilots as to who landed shorter. Of course poor Brett in his Husky had to put up with the most from all the Maule drivers. With the planes safely tied down for the night, we could relax knowing the wind pumping through the valley, causing a venturi effect, would not damage the aircraft during the night, we set off for the lodge. The Umkulu lodge is rustic yet very comfortable: it has a well-stocked bar, beautiful surroundings and lots of hot water for showers. The food was spectacular, with Gemsbuck steaks served with an abundance of side dishes, making for a delicious meal. The next morning the plan was to set out flying along the river looking for a couple of possible stops en route. But first, the task at hand was to get back to our planes and this, it was decided, had to be done by canoe on the water. Chris and I, along with Nico and Darrel, however, elected to take the long way round by road, as the prospect of getting wet in the cold in the river failed to excite us. Everybody got airborne in remarkably short distances, as to be expected from a Maule (and a Husky). I was a little concerned with the sandy soft spots on the bank, but having the lasrgest tires of the group sure help my confidence. Most everyone got off within about 500-600�. 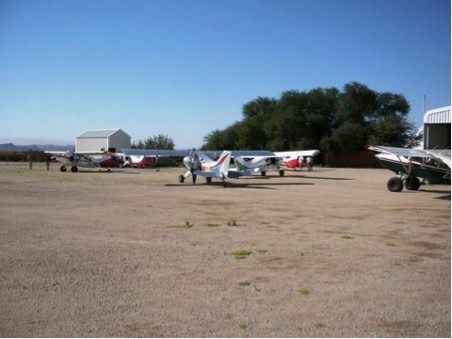 At last the Maule drivers had a chance to use their planes for the purpose for which it was build. Our next destination was Alexander Bay. The boys knew that fuel was a long way off, so all the pilots throttled right back, taking a slow cruise down the river. 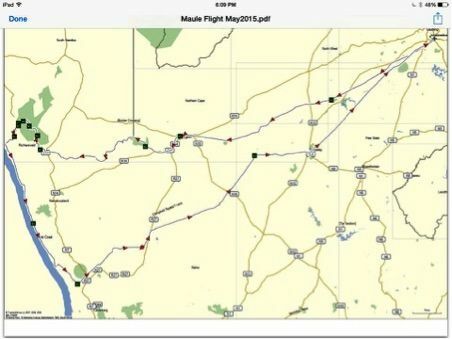 Some of the guys elected to land at a couple of abandoned strips along the way, such as Grassdrif, Ochta, Oena, Baken Mine, Sendelingsdrift and Sanddrift. Amazingly, some of these runways are still in remarkably good condition, all things considered. When we arrived at Alexander Bay, it was sad to see this once magnificent airport abandoned. There is still a terminal building there, with a control tower, and the runways are in good shape, but everything is boarded up. The Jet A1 and Avgas fuel tanks are still there, empty, and patiently waiting for someone to use them again. It would appear that the airport is still being maintained. The grass is cut and the little garden is clearly looked after, but that�s it. Ideally we would have liked to spend more time and fully explore Alexander Bay, especially now that all the entry controls have been lifted, since it�s abandoned. 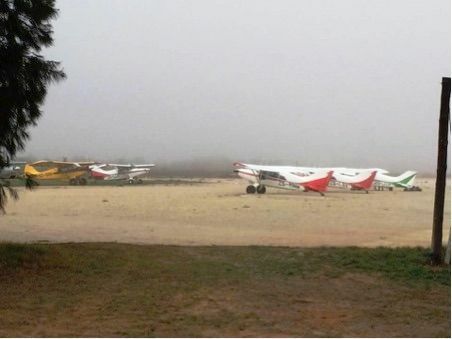 But, fog was rolling in over the Atlantic threatening to envelop the airport soon, and we had to make a hasty departure. Flying the Maule at sea level is just so much fun, it should be illegal. Having the full 28 inches of manifold pressure available to fully exploit the STOL performance of the plane, and experience the quick tail lift and with a staunch pull on the yoke to get that insane climb angle, it is about as much fun as can be had with your clothes on. Old man B.D. Maule really got it right with this plane. We set course for Hondeklipbaai. 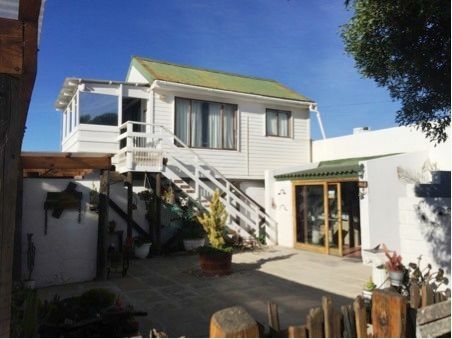 Our plan was to fly along the coast, stopping off at Port Nolloth and McDougal�s Bay, but the fog put an end to that. Around 20 minutes into our flight we were out of the fog belt and we all drifted back to the coast line to enjoy the splendour of this rugged, yet beautiful, part of this beautiful country. The rugged splendor was marred only by the remnants of abandoned diamond mines that were never rehabilitated. It is a shame that the mining companies responsible were never forced to repair the damage they created to this otherwise pristine coastline. We flew along the coastline enjoying its splendor until it was time to land at Hondeklipbaai. There was a lot of trepidation about landing there as the predicted wind was 20kts at 90 degrees across the runway. 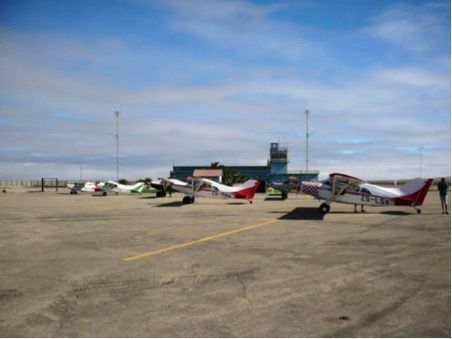 But the flying gods smiled on all of us tailwheel drivers and we arrived in Hondeklipbaai with barely a breeze. Attie Hough, our host, was waiting for us at the runway complete with make-shift windsock tied to his trailer - just in case. It was clear that the runway had not been maintained in a very long while with holes and ruts and bumps along the surface. But at least it was not a problem for any of our aircraft: we were all on large tires, slightly deflated, so as to smooth out the bumps and holes and rough surfaces a little better. The owner of Die Honnehokke, Attie Hough, was a fantastic host. We were treated to his famous seafood soup and a great Snoek braai (BBQ, South African style) that evening. 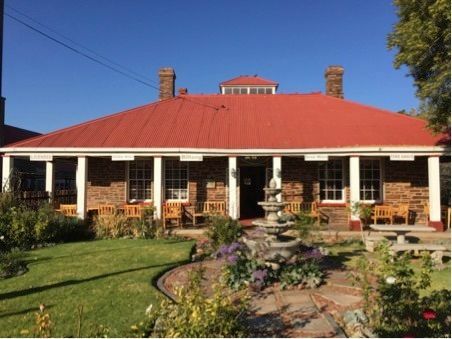 Die Honnehokke is a lovely venue and the ideal place to get away from it all. Accommodation is very comfortable in self catering units. Fuel was now running low, and the next morning we did the short flight to Vredendal for the purpose of getting fuel. Chris and I were also suffering from gluteus maximus fatigue, so a short flight with a long rest was greatly appreciated. We were met by Andrew and Jannie from the Vredendal Flying Club who graciously arranged to have 420 gallons of fuel ready for us, and every drop of that fuel was used. We took off in a huge cloud of dust created by the planes taking off. With the planes refuelled and tied down for the night, we set off for the Vredendal Hotel for a couple of cold ones and an early night (for some of us). 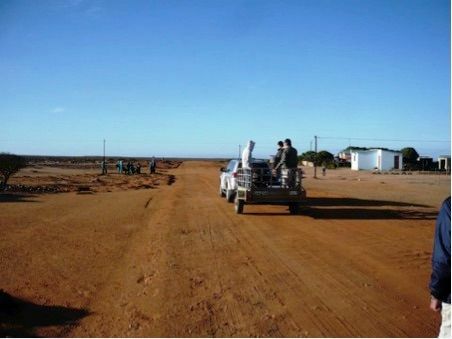 The plan was to leave early the next day and hit the salt pans between Vredendal and Griekwastad. The morning broke cold and miserable. Vredendal was enveloped in heavy fog, which put a bit of a damper on our plans. There was nothing we could do but to wait it out for a couple of hours. Eventually we saw the mist clearing from the north. 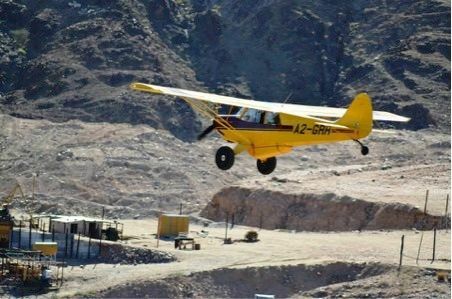 Although visibility wasn�t great, it was good enough for a take off. We knew that once we cleared the escarpment we would leave the fog behind. And, so we did. The first stop of the day was Loeriesfontein to say �Hello� to Boet Loubser and have a look at his newly refurbished Bushbaby. 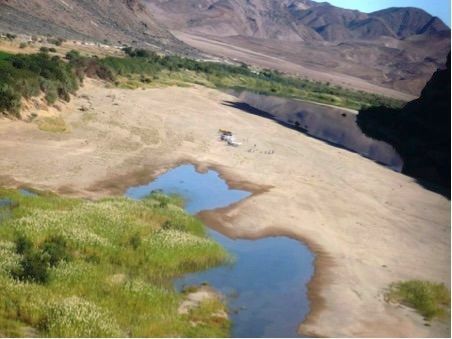 Loeriesfontein has not had decent rain (or maybe none) for 10 years. 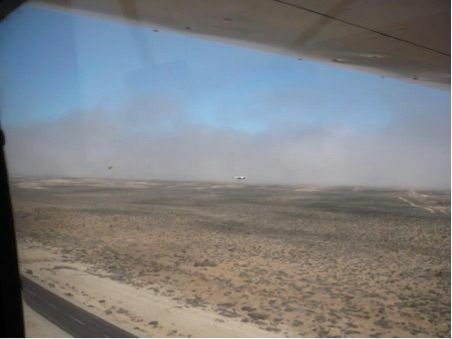 As a result, it�s windy, everything is dry and dusty, and there was a particularly nasty little gusty crosswind blowing across the runway that day. Brett with his Husky proceeded to show up all the Maule drivers with a beautifully executed crosswind technique, showing us all how it should be done - wing into the wind, touching the upwind wheel first - for a perfect landing. After a lovely visit with Boet, we set off for Griekwastad. We took off in a huge dust cloud, created by the airplanes taking off. Each had to wait for the dust cloud created by the previous airplane take off to settle, before attempting to leave. 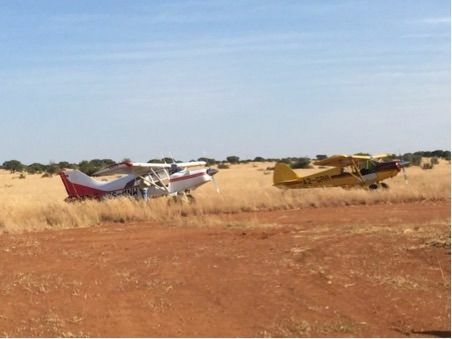 Some of the intrepid flyers chose to explore the myriad pans in the area, whilst Chris and I chose to make a bee-line for Griekwastad and the closest bathroom. One of the pans the flyers visited was Boets favourite, called Hoek van Spruit se Vloer. It is unbelievable how dry and dusty that part of the country has become, but it makes for spectacular flying conditions. Arriving at Griekwastad we were greeted by a nasty cross wind pumping at 18-20 kts straight across the runway. The wind-sock was as stiff as a broom handle pointing 90 degrees in the wrong direction. Although the runway is very narrow, it is also long. Someone at some stage placed a piece of conveyer belt on the runway to smooth out some of the very rough patches. It took some fancy rudder dancing and very active feet, but everyone landed safely. We were met at the airport by Rina Liebenberg with a couple of cold ones from the Griqua Guest house - most welcome after a day of dusty flying. They were appreciated all the more in that they were essential to get the dirt washed down and to recover some semblance of normality. Rina arranged with the local old age home to use their micro bus in order to transport us around town and end up at the lodge. We settled in and that evening had supper at the most delightful �Proviand Stoor� where we enjoyed a superb meal (meat!) freshly prepared by Rina herself. The restaurant is a restored house built from slate, and beautifully furnished with period furniture. After breakfast (more meat and eggs) we set off for Kimberley to pick up fuel and from there head back to our respective homes. Nico and Darrel took off early. 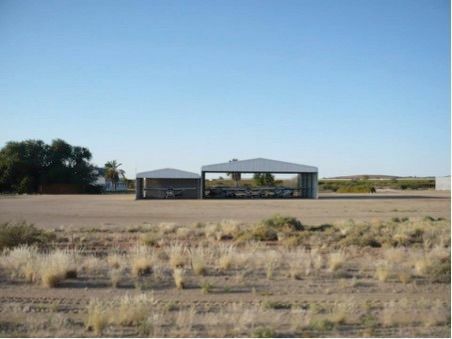 They were the first to arrive in Kimberley, only to be informed that they couldn�t get fuel until 11 o�clock that morning, unless they paid a $52 call-out fee (for being called out early before 11am!!!). The rest of us arrived in Kimberley and patiently waited for eleven o�clock, just to be informed, once again, that the fuel only opened at one o�clock in the afternoon. The linesman, was quite prepared to fuel us each up for the call out fee of $52 per aircraft. It is around that point that we unleashed Warwick on the fuel guy�s boss who eventually allowed all the aircraft to be fuelled-up for a single call-out fee of $52. This left a bit of a sour taste in everyone�s mouth. In spite of fuel in Kimberley being extremely cheap, it is an experience one would wish to avoid in the future. 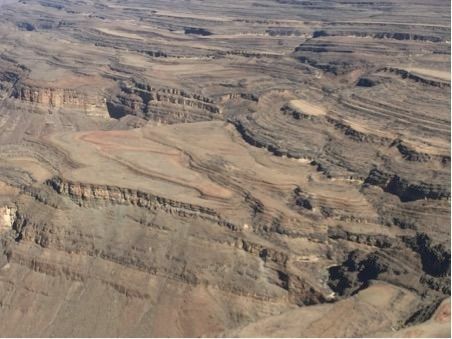 Having departed Kimberley on a flight plan, ATC graciously cleared us direct to 9,500�. We were handed over to Bloemfontein and then Johannesburg approach, where we dealt with the most delightful and kind young lady manning Johannesburg ATC. She was very professional and yet remained courteous and friendly. It was an absolute pleasure to deal with her. Whoever she is, she is complimented for her professionalism and friendliness. Thank you. 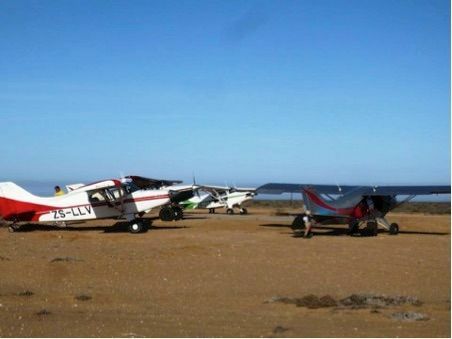 So their second Maule off-airport expedition came to an end, the first with only two airplanes, and this one with seven. A lot of new skills were learnt and a lot of old ones honed, but most of all, it was the best fun, with the best bunch of guys (and a girl) a pilot could have hoped for. South Africa is a wonderful place, and South Africans are amazing people. They made me feel welcome, and I felt right at home A Salvadoran in Africa, with awesome pilots having fun. No matter where you come from, us pilots have one thing in common: aviations. And, these pilots have another thing in common: a Maule (and one Husky)! I have found that these commonalities trascend borders! Try it, you might just like it!! The only question now remaining is where they/we are going next year. The only question now remaining is where they/we are going next year? Maybe tiger fishing in the Okavango swamps? Who know? My Mom said "Please dear, fly low and slow!" So I bought a taildragger!! Great report I'll have to start saving up for such a trip. Thank you much for the trip report PatinLoco. Chris, keep up the good work. man, that makes me so home sick. Thanks for such a fantastic trip report. You guys had a good time and it shows. Good job to Chris for putting it together. A lot of those areas that you flew around I visited with my Land Rover years ago. It brings back fond memories. Today my wife and I just got back from a couple of nights of camping in the Gila National Forest in New Mexico. A high altitude strip at 8100' MSL but a great place for peace and quiet. Patin Loco, we are planning a central/south American trip for next year and hope to meet up with you if possible. The dust drags look fun. Great Pics! When all else fails... Try again. Thanks guys! To be honest with you, Chris wrote the article also. He asked me to modify it and place it in maulepilots. So, mostly changed the South African jargon, and changed the perspective to mine. Also, liters and meters to gallons and feet. I just noticed that I repeated a picture. I'll change that. But,?what's important is that we had a blast! Hey rezrider, that would be awesome. You let me know in advance, and I'll meet you anywhere in Central America. Also, if you want, I can give you ideas of where to go, and where not to. Would love to be part of it! Nice to see your write up here too Patinloco and Chris. Epic! Looks like a great trip. Thanks for sharing! Thanks Jayson and crbnunit, a momentous trip like that one should be shared. I'm planning to go on next year's trip, but I'm looking forward to an Alaskan trip within the next couple of years. That, I can do with my airplane. Thank you for sharing your great journey. An Africa trip is now on my bucket list. I just returned 3 weeks ago from my Alaska "exploratory" trip. Flew commercial and spent a week up there with my wife and kids. Patinloco if you come through Texas on your way to Alaska, I join in with you in my Maule.